When World War Two began in 1939 Ireland declared an official State of Emergency on 2nd. September 1939. The Emergency Powers Act was enacted the following day. This gave new powers to the Irish Government for the duration of World War Two. The Irish Government now had control of censorship of newspapers and all letters. Rationing of food, clothes and petrol was introduced The six years of the war became known as the Emergency to the people of Ireland. When older Irish people spoke of the memories of the war they always called it The Emergency. Sean Lemass was appointed as Minister for Supplies in September 1939. 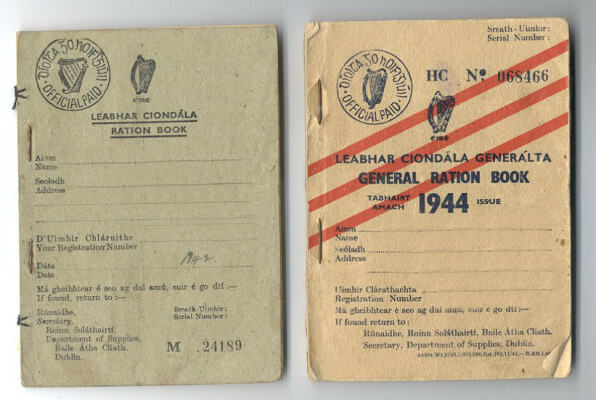 Ration books were introduced to everyone in Ireland. In this area the actual war was fought in “distant lands” but the local abiding memories was the rationing of tea, sugar, cigarettes, flour, cloth, etc. I often heard my grandmother talk about the awful headaches people got for the want of a cigarette or a cup of tea and men were known to smoke turf and dried leaves in their pipes. 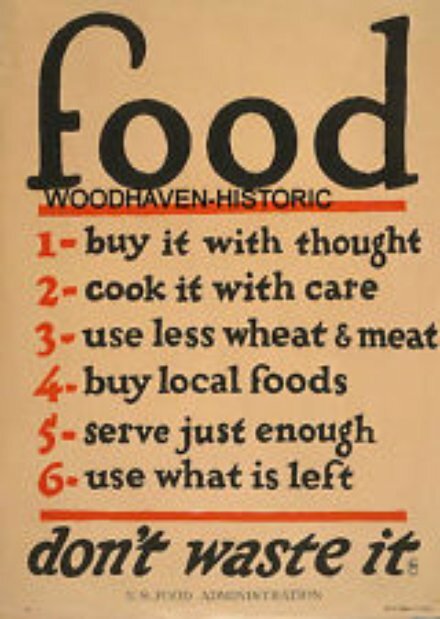 Some of the more important food stuffs that were rationed during and after the war in Ireland were tea, sugar, butter and flour. Bread was rationed in 1942. Tobacco, soap and clothing as well as shoes were other items. Each ration book had instructions and rules in both English and Irish. There were pages of numbered squares and each product required a different Ration Book. What was bought and when and in which shop had to be filled out too. The people of Ireland were lucky though because unlike Britain eggs and meat were not rationed. Locally people would have their own home produced meat and eggs, even though the eggs were valuable as they were the “money” for the shopping in most households. My grandfather shoot rabbits in the local country side around us and my grandmother would put them on the table and skin them, clean them out and then they’d have that for their dinner. Vegetables were grown at home so they had a reasonable supply. The flour was rationed and it was a course type of flour that used to make what they called “Black Bread” which I’m told was hard to eat. 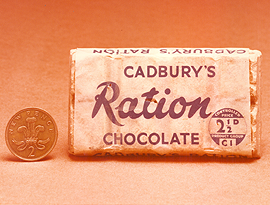 Even chocolate was rationed and as we all know the only time one longs for a sweet or some chocolate is when it is not available or the shops are closed ! So if you were a chocoholic during World War II then you had to endure the cravings and longings for the luxury item as it would have been back then. 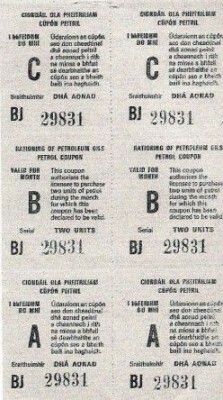 Rationing of petrol began almost immediately just after the start of the World War 2 in October 1939. In these parts there were not too many cars at any rate – indeed you could count the amount of cars in the parish on one hand I believe so the petrol rationing did not have the impact that it would have in the modern age. The official allowance for ordinary people with cars was eight gallons a month up to 10 hp; 12 gallons a month for cars 10 – 16 hp. Doctors, priests and vets also received an extra allowance. For the first few years petrol was not too scarce but by the middle of 1941 things were getting bad with many private cars off the road – some did not see the light of day again until the war was over and things returned to normal. The trains began to use turf as an alternative energy supply. It worked well but put extra hours onto the journey. Most people used bicycles or horse traps instead. From April 1944, the petrol ration that was still supplied to doctors was withdrawn altogether. They had to use horse and traps to get to their patients. The priests also had to switch to this mode of transport. 1945 saw the end of World War 2. The Emergency Powers Act was repealed on 2nd September 1946. 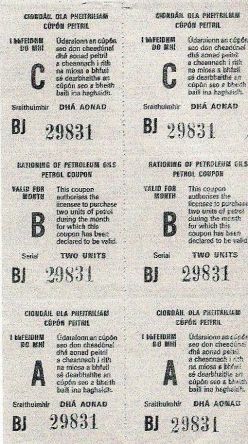 Even though World War Two ended in 1945 it was another six years before rationing came to an end in Ireland on December 17th 1951. Good News / Bad News ? I heard a story recently about an incident at the end of the war. A family living not too far from this area were trying to make ends meet during the war. This caused the man of the house having to emigrate to England for work. He got a job in the war office as a procurement officer and was one of the lucky ones to be on a good income in war times. Here in Ireland newspapers were one of the most sought after items for keeping up to date with the recent events in the world as it was pre-television, pre-telephones, etc and particularly in rural areas like here. One day a neighbour of the woman left at home went into Moylough and bought the newspaper having seen the bold headline “The War Is Over”. On his way back he called upon the woman and said “I just bought the paper in Moylough and it’s front page news ………. The war Is Over”. She replied “Well damn you anyway …………….. you never came into this house yet but you always had bad news”. Magnificent items. Continue to take care. Great web site. I was born just after it ended but the parents always reminded us that we did not know how good we had it. I still remember us not having much at all growing up ! Grandma spoke of these things to us. She often said she got blinding headaches without her tea and cigarette. Magnificent post, very informative. Part of our history that the youngsters don’t know about.